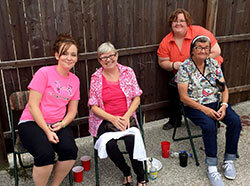 Becky’s Place is designed to “provide shelter and create hope” for women and children who are experiencing homelessness and moving toward a life of self-sufficiency. Becky’s Place serves women and children who are experiencing homelessness and are working toward a life of self-sufficiency. Our goal is to provide shelter and create hope while providing the support and services needed to help residents set and achieve goals, moving them toward education, employment and permanent housing. In addition to providing safe shelter, we offer our residents meals, case management, support services, counseling, educational resources, life skills and a compassionate, dedicated staff. Our goal is for each resident to obtain permanent housing as quickly as possible. Each resident works with a case manager to develop a life plan and must commit to seeking employment and more permanent housing. 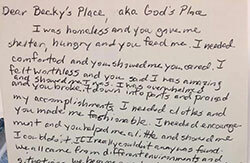 Becky’s Place has seen many of its residents’ lives impacted through our program. Becky’s Place offers a safe, home-like environment. Having the most basic needs met through Becky’s Place allows our residents the opportunity to focus on other aspects of their lives and to gain the skills necessary to work and live independently. If you want to help Becky's Place, you can get involved with financial support, material donations, serving on the advisory board, volunteering for projects or as a staff member, and through prayer. Contact us at (812) 275-5773.